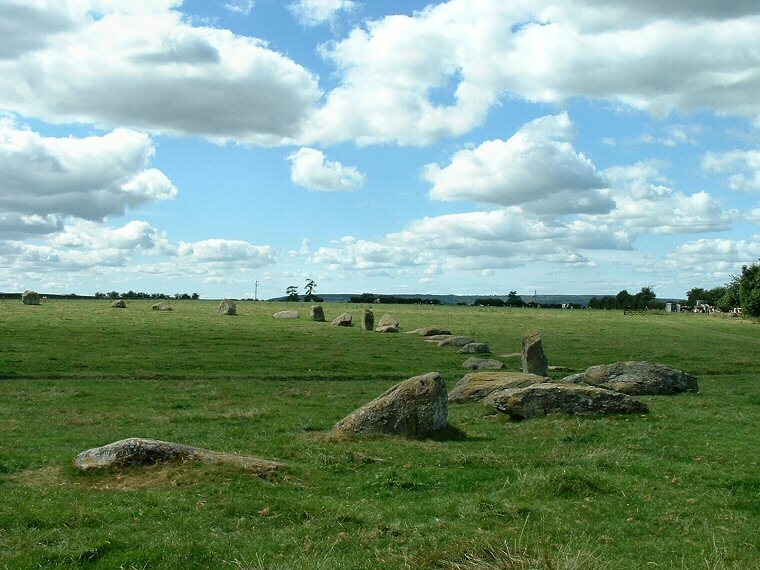 View of Long Meg with the Daughters stone circle beyond. Looking northeast, May 2002. 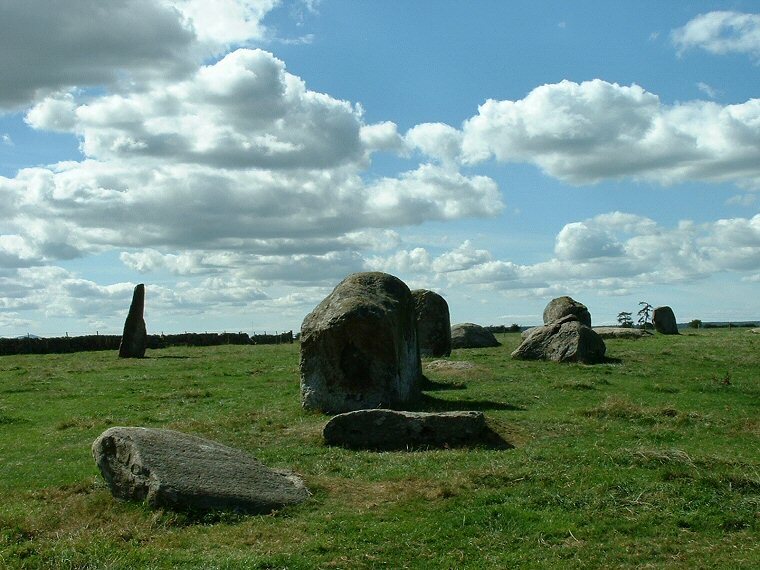 Situated to the east of the Eden Valley corridor on a gently sloping hillside the site known as Long Meg and Her Daughters is one of the largest stone circles in Britain - it is also thought to be one of the earliest, dating from the late Neolithic or the early Bronze Age. 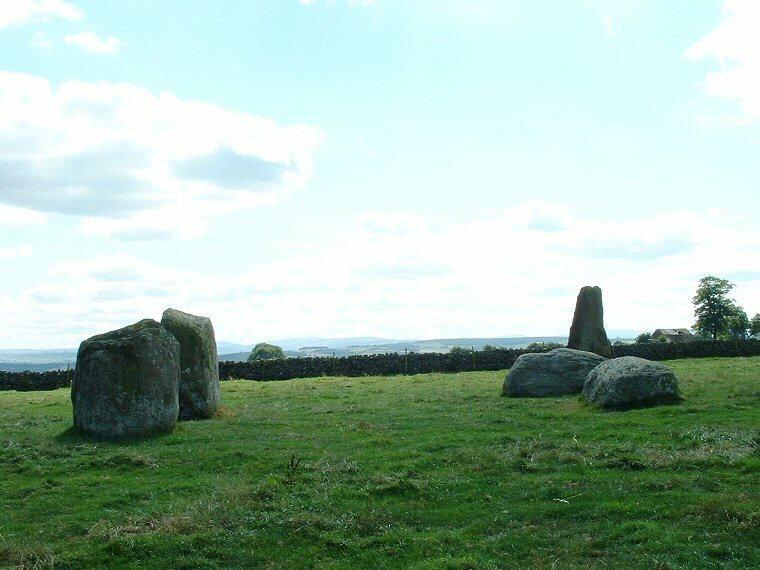 The stone circle itself (the daughters) consists of 69 granite glacial erratics, some of which are fallen, arranged in an oval flattened to the north and measuring about 94 metres north-south and 109 metres east-west, there is an entrance to the southwest that is flanked by a pair of stones just outside the circle. 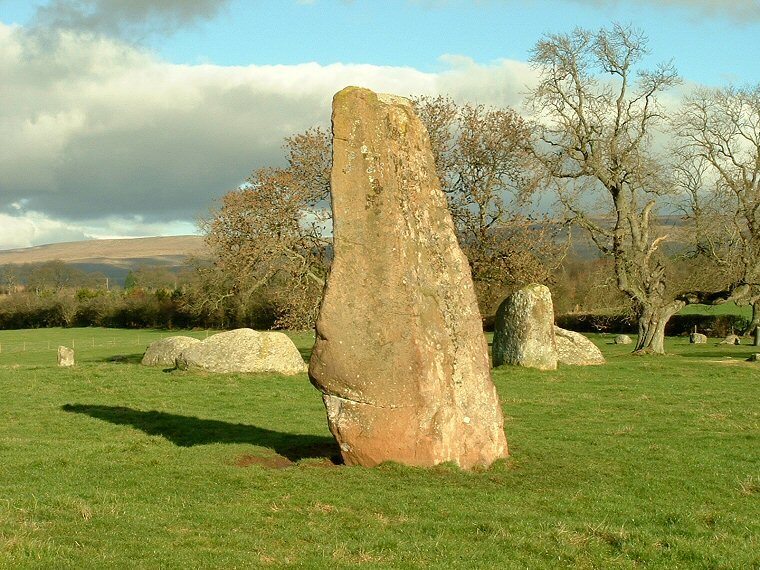 Long Meg herself (photo at far left) is a huge 3.8 metre tall red sandstone outlier 18 metres beyond the entrance and is thought to weigh about 9 tones - when viewed from the centre of the circle the monolith aligns with the midwinter sunset. 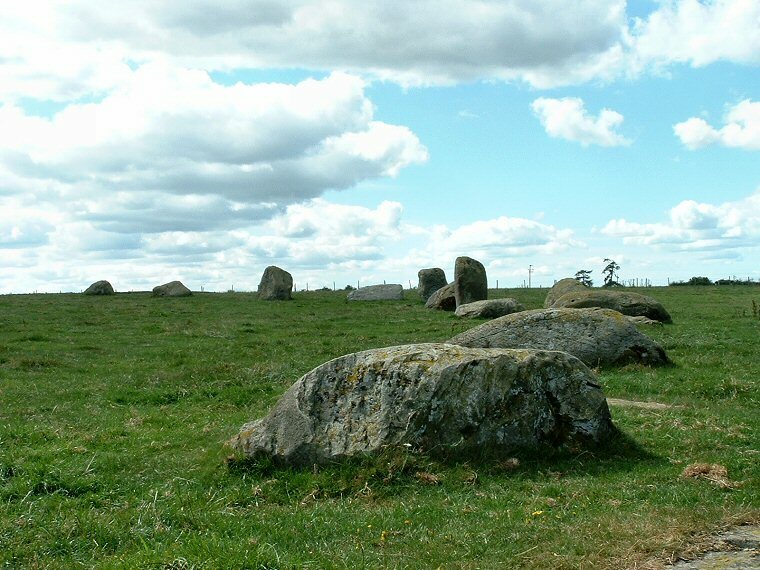 On the edge of Long Meg that faces towards the circle (the left hand face in the photo) there are a series of rock carvings consisting of cups, rings, grooves, spirals and concentric circles. 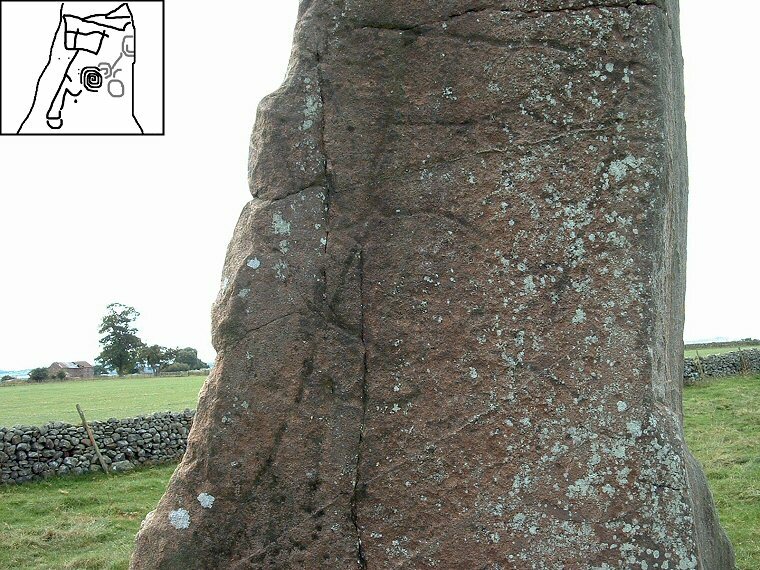 In the black and white drawing above based on Stan Beckensall's plan of the markings I have shown the more prominent carvings in black and the more faded designs in grey - it is not known if these marks were made after the stone had been erected or whether Long Meg was cut out of an existing decorated rock outcrop. 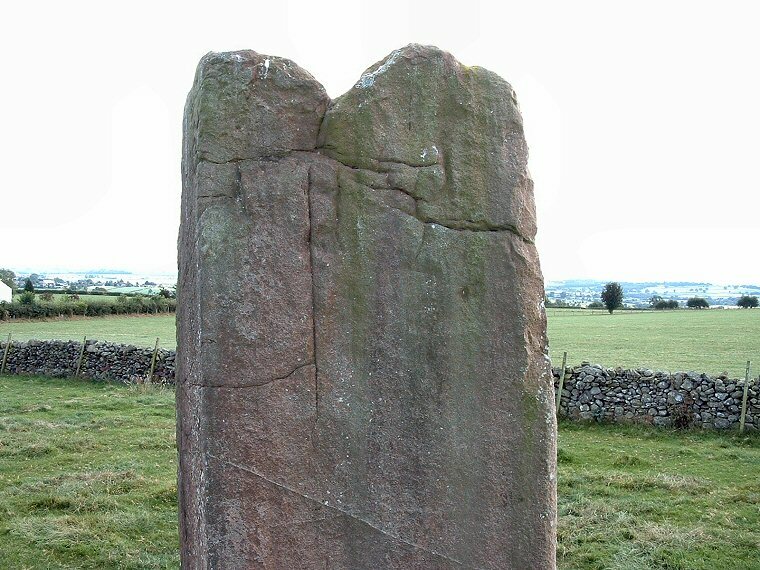 This brings us to the question of the sequence of building at the site. 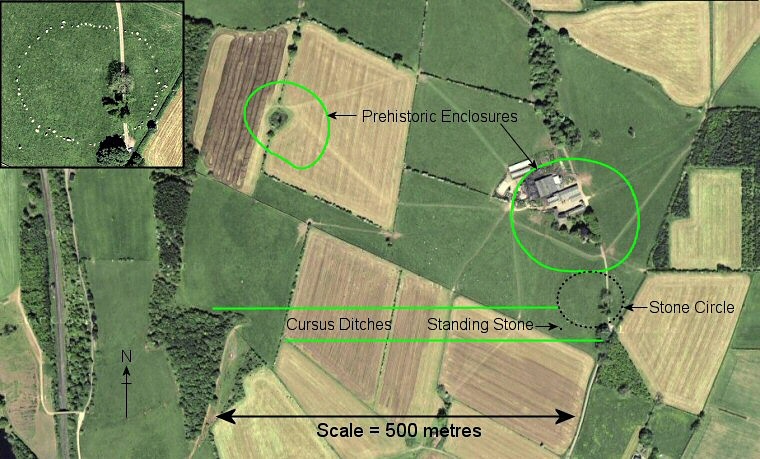 In recent years a massive ditched enclosure has been discovered to the north of the circle and this seems to explain the slightly flattened northern section, namely that the circle builders were respecting an earlier earth monument. 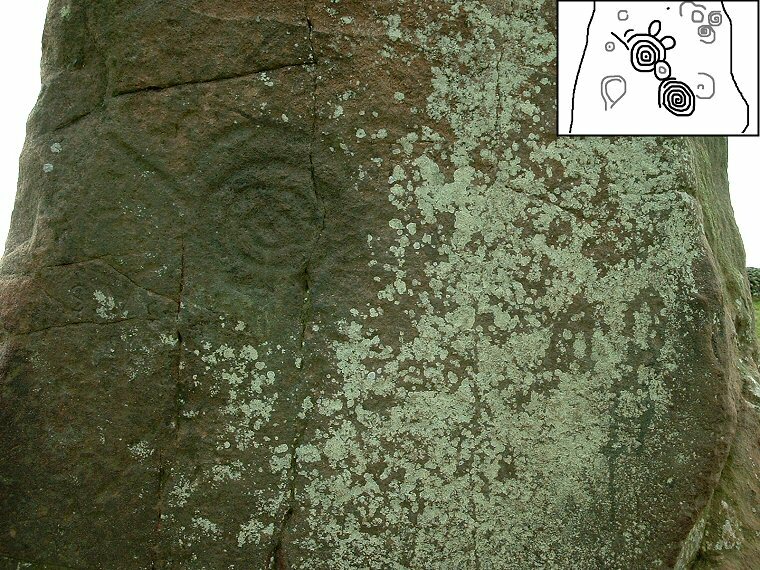 To the west of the circle aerial photography has revealed the existence of a cursus which could well be earlier than the circle while there are old reports of a pair of cairns inside the circle although these are probably of a later date. 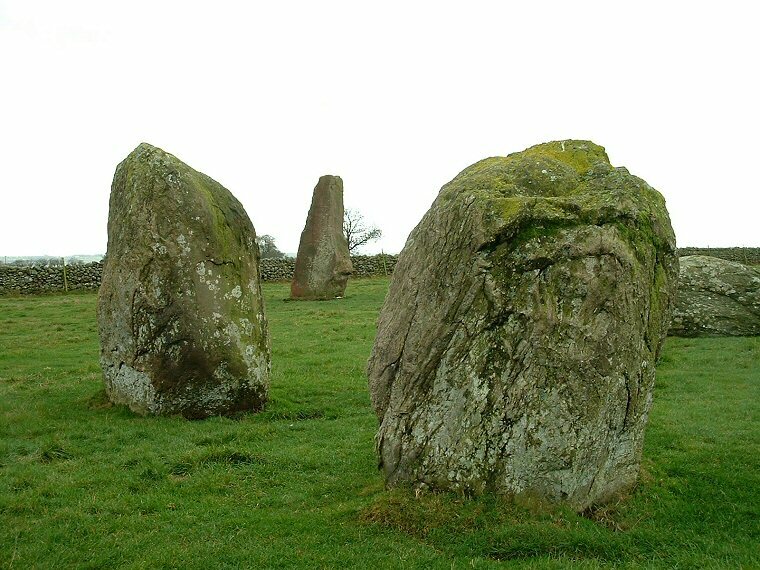 However it is still unclear whether the 'daughters' or Long Meg came to the site first or whether they are in fact contemporary with each other. 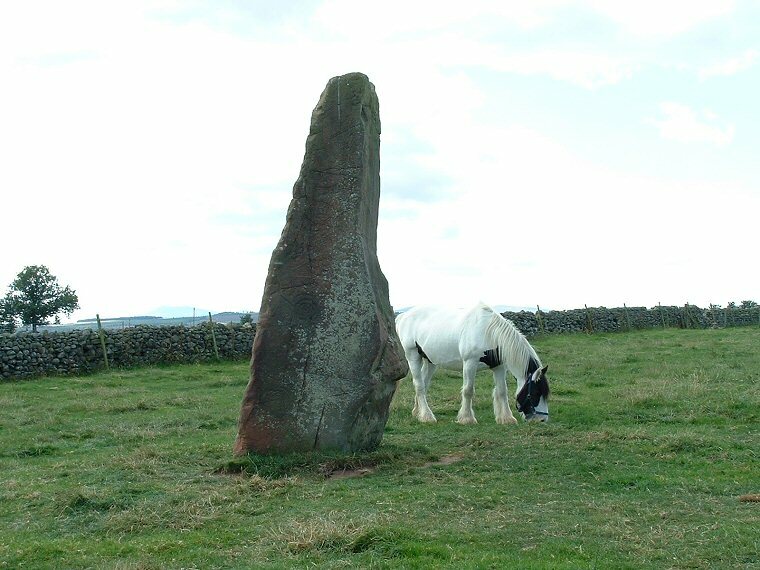 Close by are the two round cairns of Little Meg and Glassonby - both of these also feature carved stones. 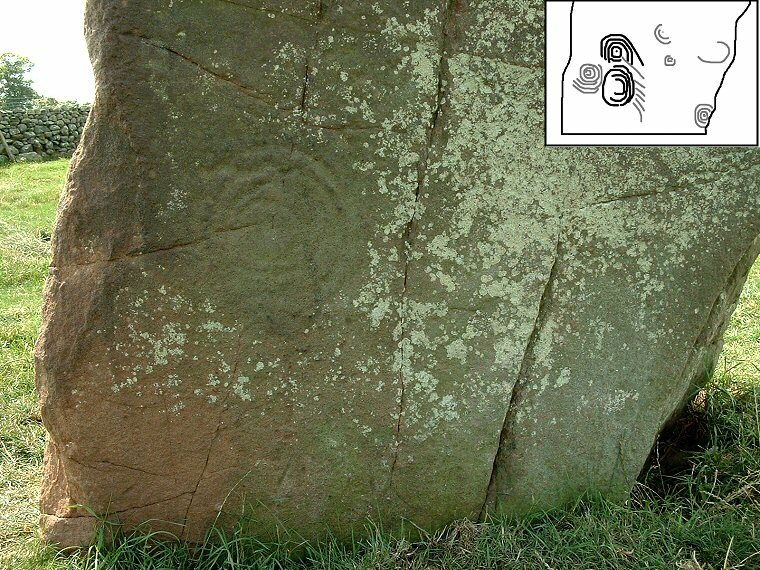 Plan of the prehistoric landscape features around Long Meg with enlarged plan of the circle and standing stone inset. 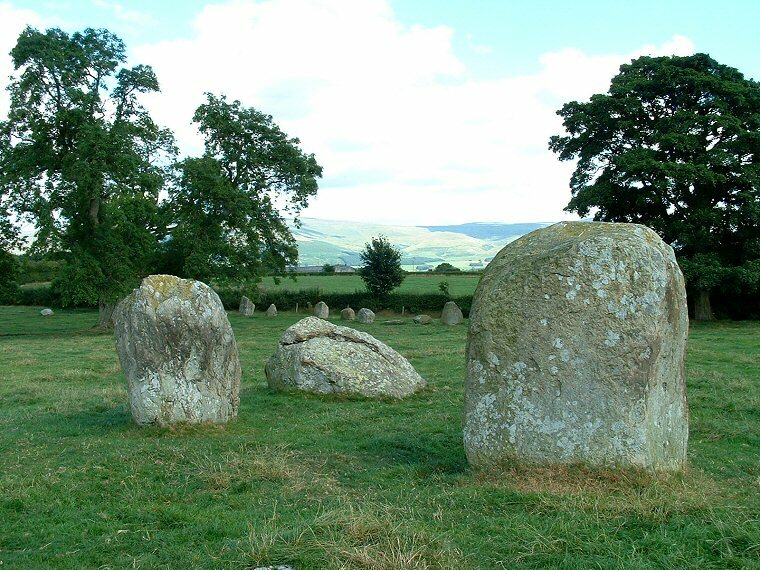 Looking northwest, Long Meg is to the far left, the circle is to the right. May 2002. Looking southwest with Long Meg hidden behind the branches of the right hand tree. 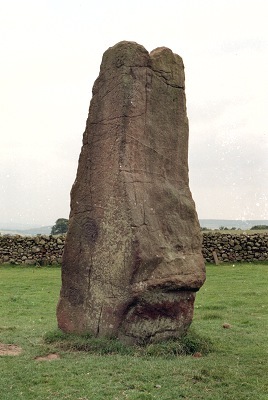 August 2003.